I am a dedicated and hardworking team-player who is able to work under pressure and deadlines. I thrive on acquiring new skills and challenges with a drive to succeed my past work experiences have helped me to develop my communication skills and knowledge of the film industry further, my confident yet respectful approach is reflected in my communication skills with my peers. I am a helpful, punctual and friendly individual ensuring that I deliver good and positive interactions with my colleagues and working to my utmost potential. I studied at Solihull which gave me the opportunity to explore different sectors and job prospects within the media industry, this course lasted for 2 years which gave me experience in film, screenwriting, advertising, marketing and sound development alongside with graphical design. This 3 year course allowed me to study a range of literature from the medieval period to the 21st century, I studied creative writing within poetry, short fiction, drama and film. In the second year of university I studied the literature and the impact of Shakespeare's work, as-well as being able to write for a small theater production this linked in with my study with Drama and Media writing. In my final year I was able to work with a specialist within a chosen media field, I chose creative non-fiction and was able to produce a short-film. Overall I left University with First Class Honors in English Creative Writing. Upon leaving University I was given the opportunity to become a runner for BBC which entailed me to various admin duties and to assist many producers and in general an overall assistant to anyone in the production staff. Responsibilities such as carrying equipment, sorting out locations and schedules and looking after VIP's was just the smaller role within being a runner. However as I achieved a First Class Honors I was able to work on various BBC TV shows such as Eastenders and primarily Doctor Who as an assistant screenwriter, my work was also credited and has made it onto the screen multiple times. After working on Season 7 of Doctor Who and receiving numerous praises and positive reviews from critics, I was offered a job at E4 to write for 'The Big Bang Theory' season 6 as a head writer and a script analyst. As a script analyst my role was to thoroughly check my co-workers and their submissions of future episodes and to make sure sub-plots were avoided not to mention having a certain characteristic which fitted the theme, which in this case was comedy. As a head writer I was given the task of producing and conceiving a specific plot for that season but also overseeing how my co-writers were doing for future episodes, I also worked closely with A-list actors and directors. After the success of Season 6 of 'The Big Bang Theory' which currently stands as the highest income and viewership for that show, the head of Marvel had contacted me about re-working on the screenplay for Marvel's 2015 upcoming Ant-Man. As a screenwriter my job was to re-evaluate the original screenplay and remove various sub-plots, incorporate background material (such as origin stories) and coming up with various themes which can connect with other films. I was also given the position of becoming an Assistant Director which gave me the responsibility to make sure the production of 'Ant-Man' was happening daily, arranging logistics, checking with both cast and crew and also carrying out various risk assessments to ensure a healthy environment. I am currently employed at Marvel Studios as a Screenwriter, Script Analyst and an Assistant Director for their future TV show's and upcoming films whether as a head or attached to a project. 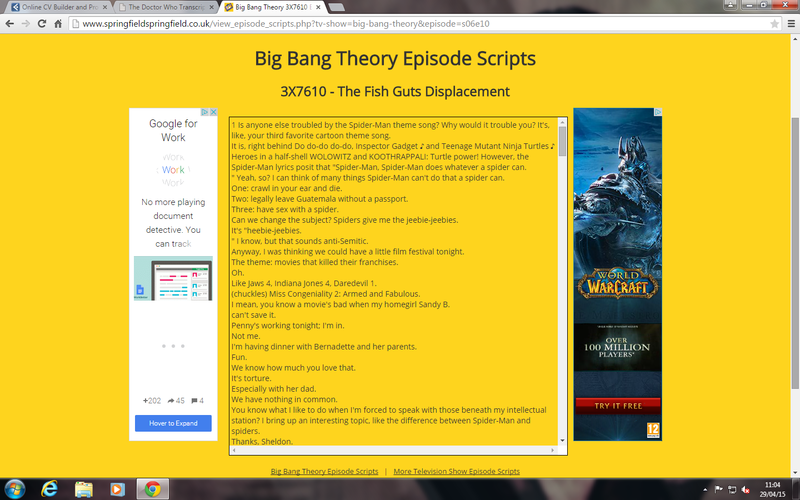 Here are two scripts which I previously worked on from The Big Bang Theory and Doctor Who.